Enter to win a Myrtle Beach Family Vacation here. Ready to break to the beach? 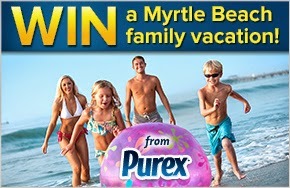 Win a trip for your family to Myrtle Beach, SC & Crown Reef Resort from Purex. Enter for your chance to send a family of four to Myrtle Beach, SC for a vacation full of sun & adventure at one of the top beach destinations in the country, and receive a year’s supply of your favorite Purex detergent! Enter to win $1000 and a years supply of new Purex No Sort by clicking here. 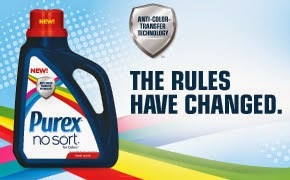 NEW Anti-Color-Transfer Technology™ helps keep dyes from transferring onto other fabrics in the wash. Enter for your chance to WIN $1,000 & a year’s supply of this game-changing NEW detergent, so you can avoid extra laundry loads.